I still remember clearly my first time. I was 18, and sitting alone in my warm dorm room on a cold, sleety, Rexburg morning in the Fall. The hall outside was quiet, and a tranquil ambience enveloped the softly lamplit room, a cozy contrast to the gray, blustery day outside the window. For those of you who, like me, are having a very long day today, take a few minutes to enjoy this video. It is in German, with English subtitles: the German version of “Candid Camera”. This prank is hilarious (and it brings back fond memories of being in Germany too)! It’s not shockingly new, so you might have seen it already, but I just saw it for the first time today myself. Enjoy! John posted this a few years ago. I love it though, and it reminds me of my days as a graduate student when I learned Old Saxon by reading the Heliand in its original language. So enjoy the birth of the Chieftain as experienced by the medieval Saxons! Because Christmas as we know it is built upon the vestiges of pagan holidays, my mind turns to the ninth century Heliand poem (c. 830 A.D.) at Christmastime. This is a poetic translation of the New Testament done by a Saxon monk in Old Saxon. The poet does a superb job of translating the Gospel not only linguistically but also culturally into a language comprehensible by the Germanic tribes of more than one thousand years ago. And the story of Christ’s birth expresses some of the poetic license taken by the monk while still conveying something powerful about our Savior and about his Gospel. Enjoy. Almost nothing in this world is more precious to me than newborn children. Four times now our home has been blessed by the arrival of a tender, innocent newborn; our halls hallowed by their sweet, helpless cries. Having a new baby in our home is like having a fresh piece of heaven to savor and hold close, a glimpse into the eternal world from whence we came and where we are destined to return. 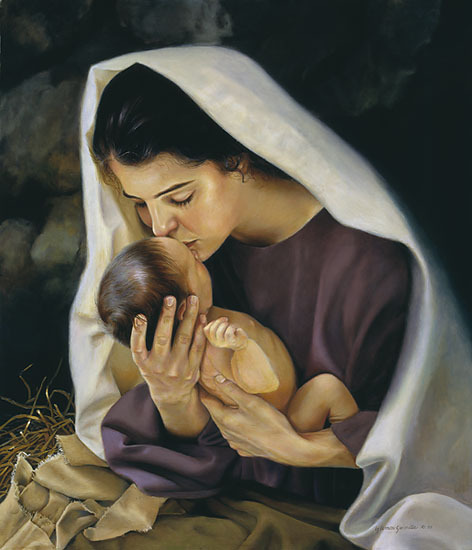 When I hold a dear infant in my arms close to my chest, the soft, new hair brushing my cheeks as rhythmic breaths gently caress my neck, I feel God’s love in a larger measure than usual, encircling me with its cozy warmth and penetrating every nook and cranny of our home with its light. Such is the power of one of the humblest, most helpless creatures on Earth: the newborn babe. You are currently browsing the ABEV: a bird's eye view blog archives for December, 2007.